The real power in the use of Microsoft Office is the ability to fully Integrate and Automate the various desktop productivity tools, along with SQL Server, Azure, and Microsoft Power BI. Thus, eliminating mundane highly manual and time consuming practices, while simultaneously improving accuracy. An example of Integration and Automation of Microsoft applications: VBA/Macros allows you to click a button on an Access Form that will run a series action queries, export that data into Excel, create Excel reports, Excel Dashboards, insert those into PowerPoint, and e-mail a PDF of the report to your team via Outlook, all with the single click of the mouse. The Result (Savings): Two days worth of work saved per week. Now that is a Smarter Microsoft Solution. You need to leverage the incredible power of a fully integrated and automated Microsoft Office solution to get the most out of your custom applications. Without VBA, Excel and/or Access is a collection of worksheets, tables and queries. Add VBA and you truly see the relationships within your data and what it is telling you about your operations. SQL Server extends the range of Microsoft Access capabilities to allow for truly enterprise wide solutions. We also support SharePoint and Azure and understand the paramount importance of correct configuration. Microsoft Power BI leverages the skills of our data scientists and BIG data visualization experts. In the past few years we have become a company of internationally recognized data-scientist, analytics professionals, data visualization experts, authors, and speakers. 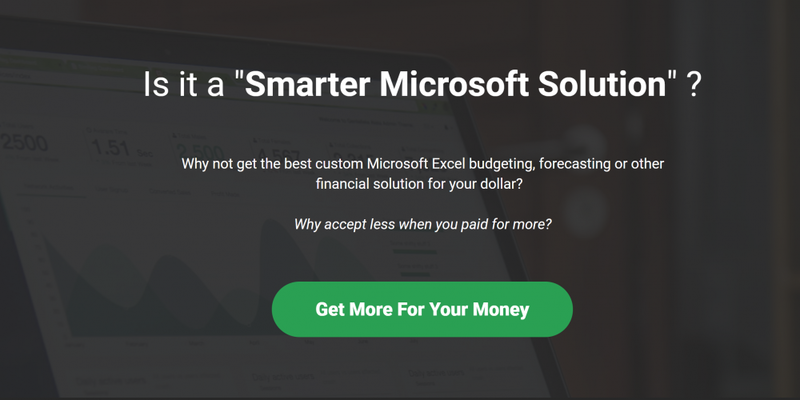 The Excel Consultant team are the go-to-guys when it comes to Mac 2004, 2008, 2011, 2016 and 2019. We happen to have Microsoft certified trainers that actually conduct training sessions at Apple headquarters. Our Microsoft Certified Programming Services start with a detailed conversation, (a free 45-minute consultation, a $60 value), about your needs and our Smarter Microsoft Consulting Services. We will discuss every aspect of what you need to have done, why you currently do things the way you do them, and ultimately we will discuss a better way to do things. Our dedicated international programming staff has the expert experience to quickly identify the problems that your organization is having with all of your Microsoft applications. This makes it possible for us to build a 100% custom Microsoft Excel, Access or Power BI program-driven solution. These solutions are fully automated and integrated and these 100% custom solutions fit your exact and unique business needs for a very low cost, a mere fraction of the cost of an internal employee. Pay or the work once, and save each time your staff runs the solution. Our Smarter Microsoft Solutions include expert VBA/Macro Programming in all Microsoft Applications, including Microsoft Power BI. Working Smarter rather than harder will ensure that your company can continue to scale up based on the demands of growth. Building a Smarter Microsoft Solution with a point-and-click graphical user interface means your staff can do more work in a fraction of the time. They can thus working on something else, something more important such as increasing profits or expanding sales. It’s very easy for a company to say their mastery of macros/VBA (Visual Basic for Applications) and their Microsoft programming is “top-notch” or “expert”. We believe that the proof is in the final deliverable. Results speak for themselves. Our 83% client repeat rate and their 300+ testimonials and 25 years of operation show that we are the best expert Microsoft Programmers in the space. We are the Microsoft Certified Microsoft Excel, Access and Power BI programming experts. Let us make Microsoft’s technology work for your business, government agency, educational institution or non-profit.